He was taught the fundamentals at Center Junior high School under the tutelage of Everett Saunders and Walter Taylor. Charles parlayed that knowledge with his vast talent and strong work ethic to become a three sport star at Waycross High School from 1976-1979. On the basketball court Charles scored more than 1,700 points, grabbed over 800 rebounds, and had over 200 assists. He was a member of Joe Haluski’s Region Champs in 1976-77and was the team MVP in 1979. A wide receiver on Dale Williams’ 1977 State champions he had almost 200 career receptions for 2,500 yards and led the team in touchdown catches. His senior year, he was chosen the best receiver and was in the top 100 players in the South. He played in the North-South All Star game and came in second in MVP voting. 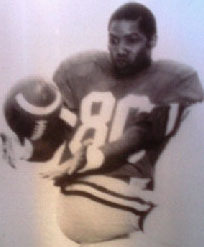 Charles earned a scholarship to the University of Georgia and played on three consecutive region champs from 1980-82. He was a member of the 1980 National Championship Team and his teammate was Herschel Walker. He received a BS degree in Education from Georgia while maintaining a B average. Charles is a member of Phi Beta Sigma Fraternity, Inc. and the Star Mount Zion # 370 Masonic Lodge.